GALA BENEFICA "AMIGOS PARA SIEMPRE"
EL DIA 22 DE OCTUBRE A LAS 22 H.(PREFERIBLEMENTE ESTAR A LAS 21H. 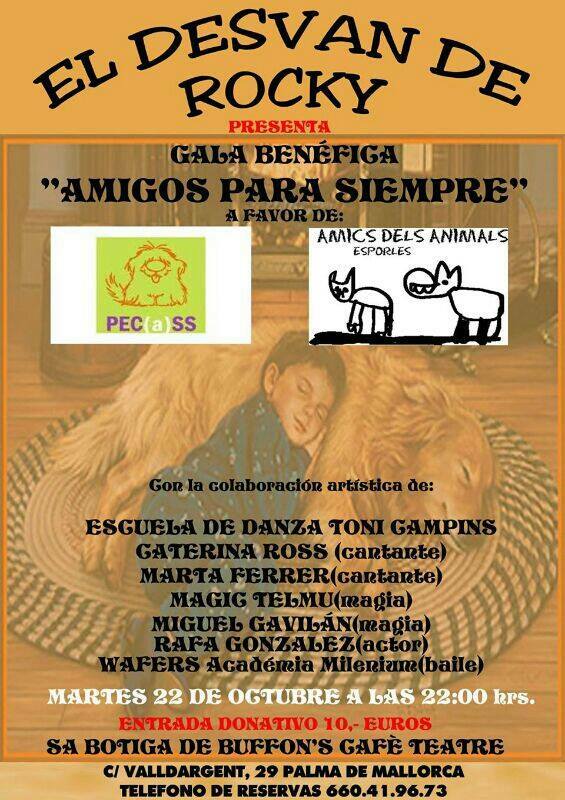 PARA LA PRESENTACION) CELEBRAMOS ESTA GALA BENEFICA EN BENEFICIO DE ASOCIACION PECASS Y AMICS DEL ANIMALS D'ESPORLES. LOS 10 € QUE SE PAGAN DE ENTRADA SERAN ENTREGADOS INTEGRAMENTE A DICHAS ASOCIACIONES, LO QUE SE CONSUMA EN LA GALA UN TANTO POR CIENTO TAMBIEN SERA BENEFICO. HAY QUE RESERVAR YA QUE EL AFORO ES LIMITADO Y LAS PLAZAS SE AGOTAN RAPIDAMENTE. LLAMAR AL TELF 660419673 PARA RESERVAS.